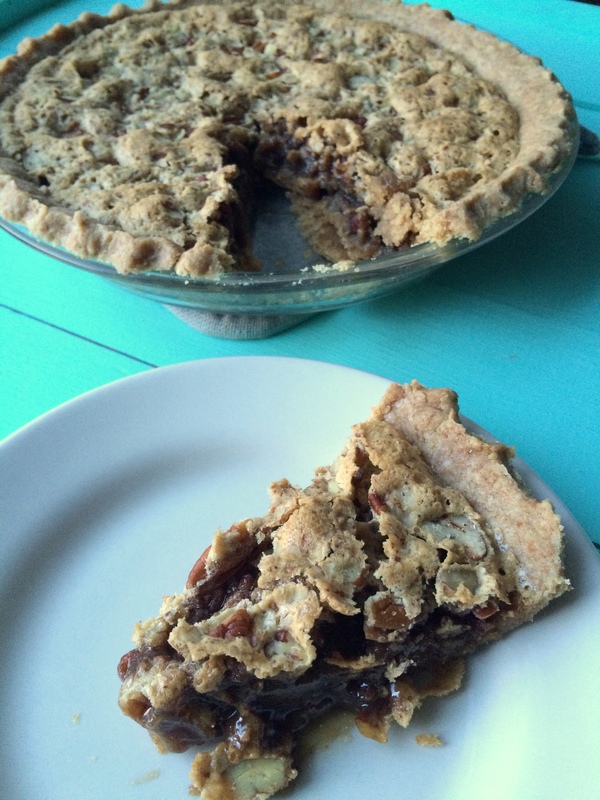 I LOVE pecan pie. This is my absolute favorite Thanksgiving food item, right along side sweet yams and warm, soft dinner rolls. I love the sweet and salty combination, though I don’t love all the corn syrup, so last year I decided to make one from scratch, corn syrup-free. There is still sugar, both brown and white, but it’s a step up :). It was wonderful and I loved that it still was “carmely” tasting and had some of that ooey goeyness in the middle(brown sugar was a big part of that), though with a crusted over top. 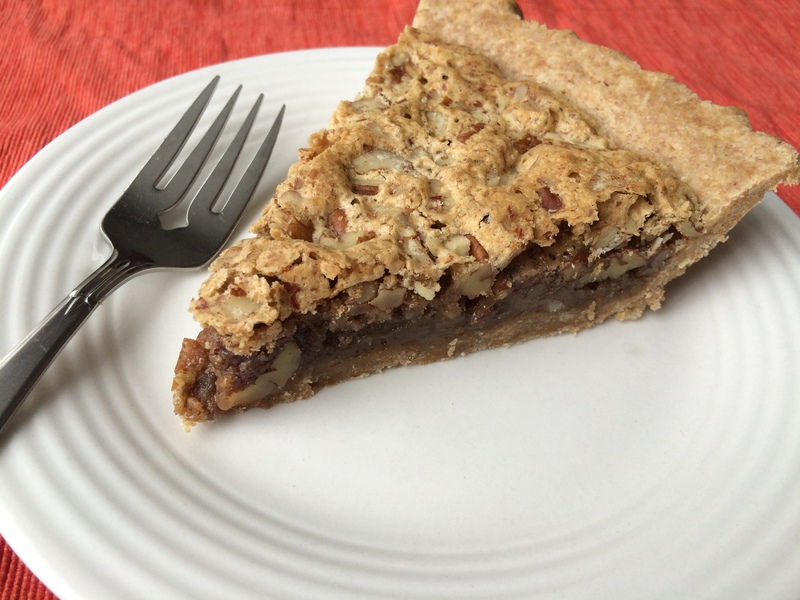 And I made it on a whole wheat pie crust, which recipe I’ll also share here. 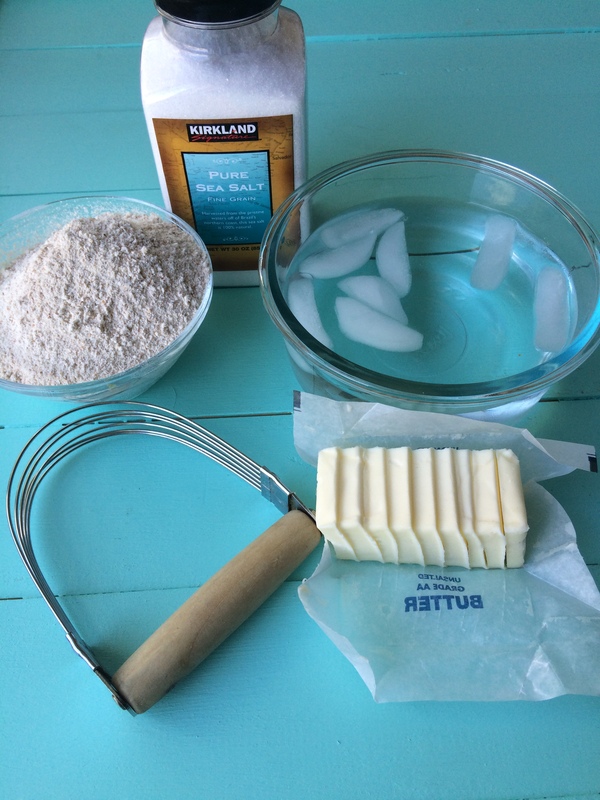 These are your ingredients for you pie crust: whole wheat flour, salt, butter, and ice water. Make your pie crust first by putting your flour and salt in a medium sized mixing bowl and cutting in your butter with a pastry blender (or two forks, or in a food processor). Once the butter has broken upon and looks like it’s been crumbled into pea sized pieces, you’ll want to add your water, a tablespoon at a time, until it starts to stick together when pressed between your fingers. On a piece of parchment paper, form the dough into a disc. Place another piece of parchment paper on top of the dough disc, and with a rolling pin directly on the parchment paper, roll out the dough to about a 9 inch circle. Take off the top layer of parchment, put your pie pan in the center of the dough, upside down, and turn the dough and pie pan over so that the dough fits nicely inside the pan. Peel off the parchment and then with your fingers, lightly press the dough into the pan, tearing off any excess and patching spots if needed, and then you can use your thumb and index finger to pinch the edges of the dough together to make a nice looking, fluted edge. Poke the bottom with a fork a few times to prevent bubbles forming. 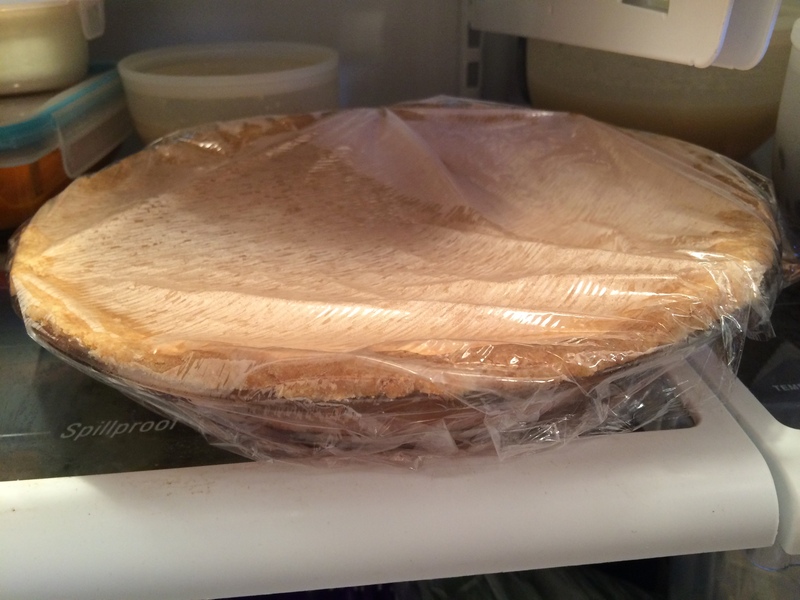 Cover with saran wrap and place in fridge while you preheat your oven and mix up the filling for your pie. 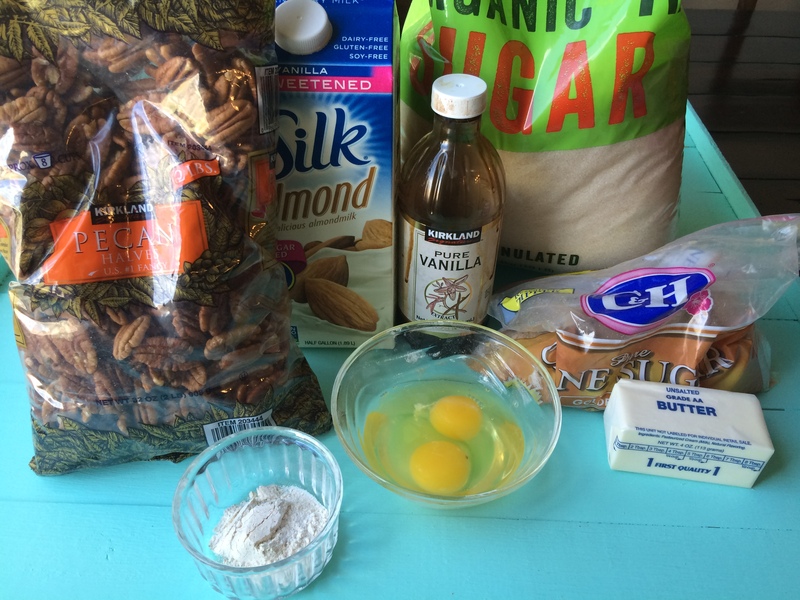 And here are your ingredients for your pecan pie filling. I used an evaporated cane juice sugar, but feel free to use whatever granulated sugar you have on hand. 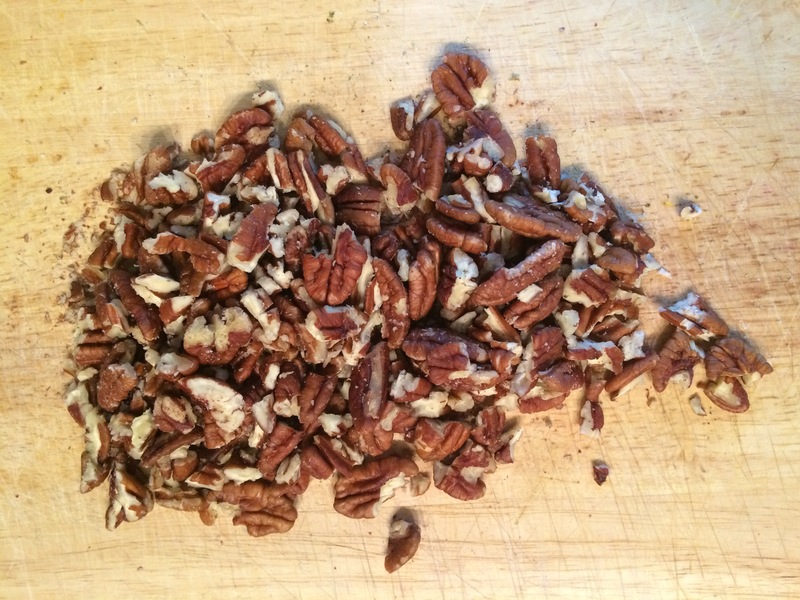 These are what my ‘roughly’ chopped pecans look like. You can leave them bigger or chop them smaller, it’s just personal preference here. Preheat your oven to 300 degrees. In a large bowl or in your bosch or standing mixer, beat eggs until foamy, and stir in melted butter. Stir in the brown and white sugar and flour; mix well. Add the milk, vanilla and 1 c nuts. I used almond milk because that’s what I have on hand, but cows milk will work great too. 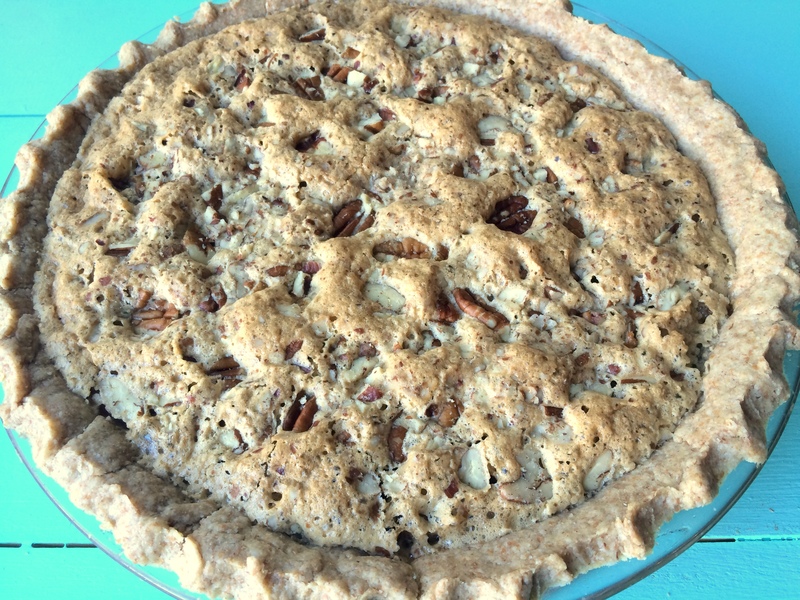 Pull the uncooked pie crust out of the fridge(or use another uncooked crust you have on hand) and pour this mixture into the crust and then top it with the other 1/2 c pecans. Bake in your preheated oven for 45-50 minutes or until done(not jiggly when you shake it). Once done, Put it in your fridge again, on a hot pad, and allow it to set for at least one hour before serving(otherwise you’ll have an ooey gooey mess when you cut into it). 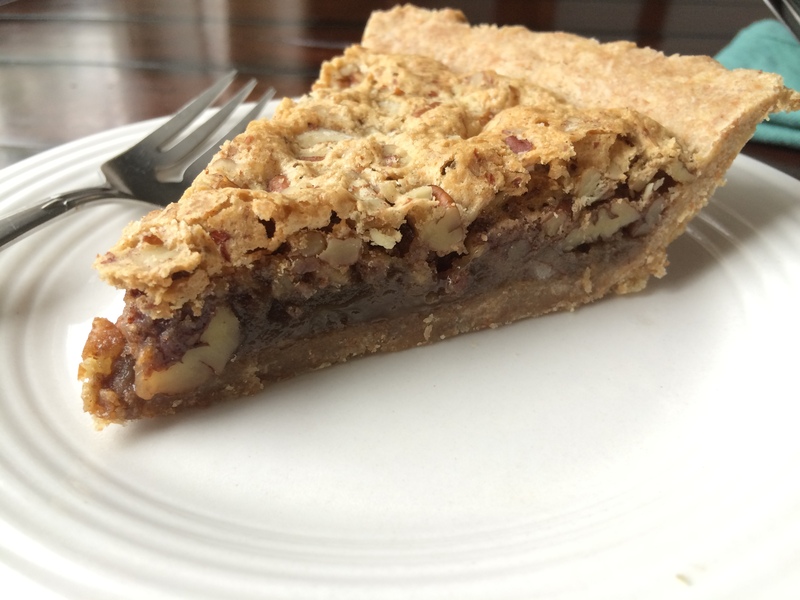 You can definitely make this pie a day ahead of time and store it in the fridge. So yummy! 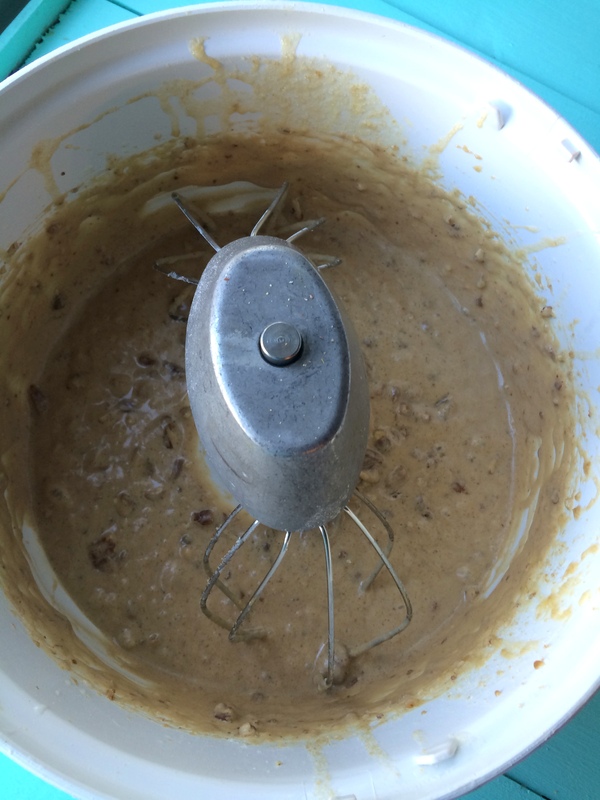 Mix flour and salt in food processor(or with pastry blender) and pulse a few times to mix. Add the pieces of very cold butter and pulse until it resembles cornmeal. Add water a little at time, pulsing as you add, until the mixture has curds and sticks together when pressed between your fingers. On a piece of parchment paper, form the dough into a disc. Place another piece of parchment paper on top of the dough disc, and with a rolling pin directly on the parchment paper, roll out the dough to about a 9 inch circle. Take off the top layer of parchment, put your pie pan in the center of the dough, upside down, and turn the dough and pie pan over so that the dough fits nicely inside the pan. Peel off the parchment and then with your fingers, lightly press the dough into the pan, tearing off any excess and patching spots if needed, and then you can use your thumb and index finger to pinch the edges of the dough together to make a nice looking, fluted edge. Cover with saran wrap and place in fridge while you preheat oven and mix up the filling for your pie. Preheat oven to 300 degrees. In a large bowl, beat eggs until foamy, and stir in melted butter. Stir in the brown and white sugar and flour; mix well. Add the milk, vanilla and 1 c nuts. 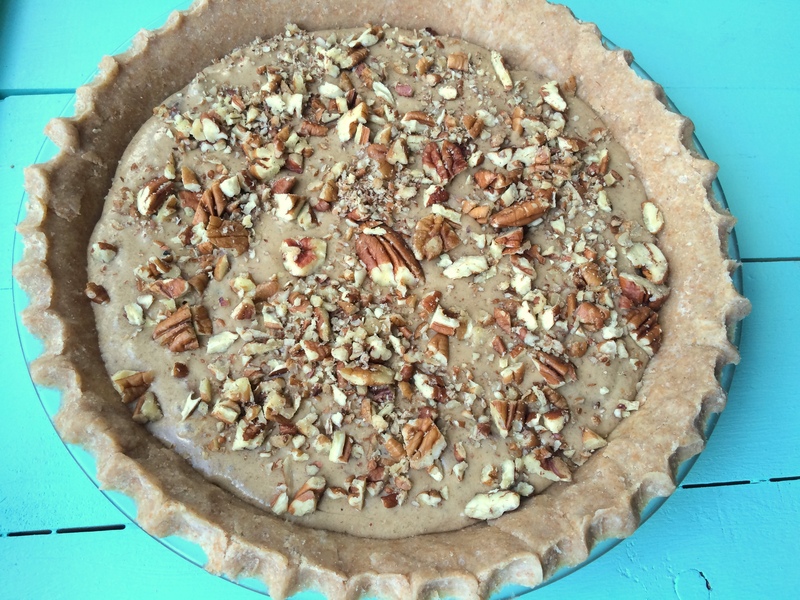 Pour into an unbaked 9 inch pie shell and top with the other 1/2 c pecans. Bake in preheated oven for 45-50 minutes or until done(not jiggly when you shake it). Put in fridge, on a hot pad, and allow to set for at least one hour before serving.